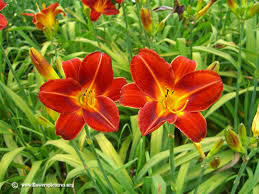 This daylily is very easy to grow and takes absolutely no care for it to be amazing and beautiful!!!!! Have ordered these in the past and was so pleased that I ordered some more. Was concerned when plants arrived with bare roots, but the blooms are beautiful and they are doing great! I wasn't sure how these were going to turn out, since I haven't bought many plants online. We decided to give them a try anyway, and they are really taking off! Red Day-lily is a diverse perennial plant that can be grown and celebrated around the world. These flowers can be used in large, stunning bouquets. These versatile plants can even be grown inside in containers. This plant needs moist soils but soils that remain well drained. This plant needs up to 6 hours of sunlight to grow as needed. These red flowers attract bees, butterflies, and hummingbirds that feed on the nectar in the flowers. These flowers are beautiful as they appear in a dark red with yellow centers to them. They provide lots of color to all gardens and natural areas where they are planted. These flowers grow great in areas that supply moist and well-drained soils. 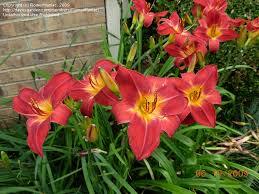 Red Day-lily can also grow in sandy and heavy clay soil conditions. They look great when there are a lot of them planted together and also adds great curb appeal to a home when they are in bloom. The usually bloom during the early spring and early summer months of the year. The botanical name is a Greek name and means beautiful and day. These plants also do great when planted around water gardens, ponds, and lakes. The Red Daylily is one of the most beautiful and classic of all daylilies. Its striking flower blooms a brilliant red trumpet-like bloom that is bordered by a contrasting yellow throat. Red Day-lily petals appear to have a pie crust edge, and each flower lasts no more than 24 hours, sometimes replaced by another on the same stalk the next day. These gorgeous flowers are drought tolerant and able to grow in the hardest areas with little care. They will bloom the middle of summer, and since they are growing in clumps, these perennials can be divided and replanted to continue to enhance your garden. They thrive in full or part sun and appeal to butterflies and hummingbirds alike. Red Daylily is a beautiful choice for flower beds, shrub borders or just in containers near the patio.